Bernie Sanders Pledges To Do A Better Job Of Explaining Socialism In an interview with NPR, the Vermont independent talked about why he's running again and his place as a white man in a diverse field of candidates. 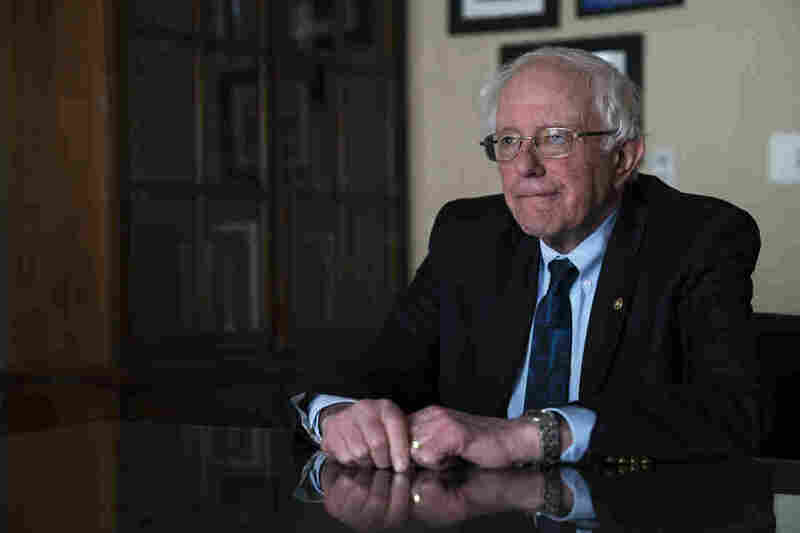 2020 presidential candidate Sen. Bernie Sanders spoke with NPR. Not only that, but he is running against candidates who have adopted positions he energized Democrats around in 2016, such as Medicare-for-all and a $15 minimum wage. 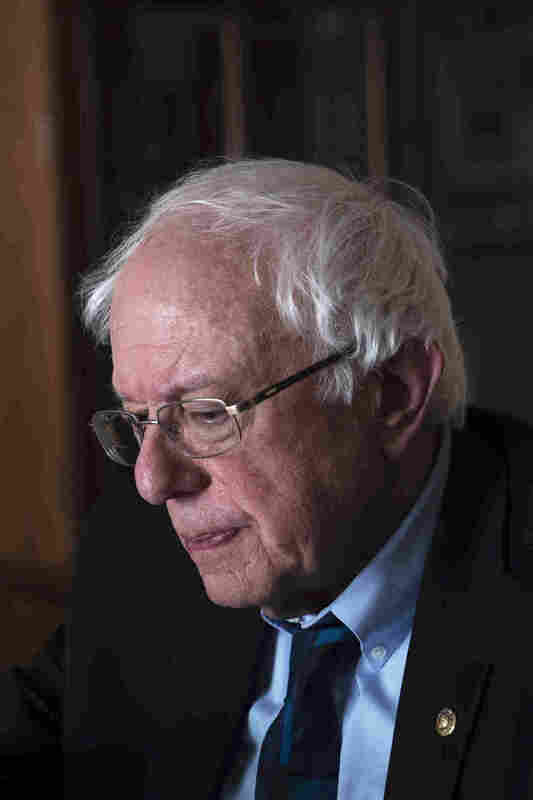 NPR's Rachel Martin spoke to Sanders about differentiating himself in this field of candidates, as well as why he thinks he can win this time. Sanders is the fourth candidate Morning Edition has interviewed as part of its Opening Arguments conversations examining White House hopefuls' core messages. Martin: "The ideas that you championed during that  campaign, which were then considered fringe are now not fringe. ... So if we take the Democratic presidential field, you've got candidates now who who sound like Bernie Sanders. So why do you need to run?" "Look, I've been doing this for a long time, and I'm very proud of the 2016 campaign, in the sense not only that the ideas that we fought for, which were, as you indicated, considered radical and extreme, but are now accepted. "But the other part of the equation is that we reached out to the American people, and we said, look: it's not just the progressive agenda that we have to fight for. You need to be involved in the political process. If you want to transform this country, you can't do it unless millions of people begin to stand up and fight back, because change never occurs from the top on down. It's always from the bottom on up." In the 2016 Democratic race, Sanders ran against Hillary Clinton in what became a simple outsider vs. establishment confrontation. His ideas, including single-payer health care, a $15 minimum wage and tuition-free college, set him apart from Clinton and also helped him earn legions of fervent supporters. Sanders scored a sort of victory after 2016, as many of his ideas have caught on. But that victory may make his 2020 run more difficult, as he is now running against several other candidates with similar ideas. The challenge this time is not only to sell those ideas to skeptical, more-moderate voters, but to differentiate himself from other progressive candidates such as Sens. Elizabeth Warren of Massachusetts and Kamala Harris of California. "First of all, I mean, all of us agree that we want more diversity in our politics. I'm very proud of the fact by the way we played a role in this. I campaigned very hard for women candidates, for African-American candidates, Latino candidates. And if you look at the freshman class in the U.S. Congress, man, that does look like America in a way that we have not seen in a long time, and I'm very, very proud of that. "But when I hear people, Democrats, independents talking, what they say mostly is we desperately must have a candidate who can defeat Donald Trump. And I think if you look at the 2016 election, if you look at areas where Secretary Clinton lost — in Wisconsin, Michigan, Pennsylvania, Indiana — I think we are as strong, if not stronger, than any other Democratic candidate in winning those states. "So I intend to be campaigning vigorously all over this country. We intend to be putting together a strong coalition of blacks and whites and Latinos, Native Americans, Asian-Americans. We're going to focus on creating a government and an economy that works for all, and not just the 1 percent. And I think that's the formulation that can win the nomination and win the presidency." Democratic voters showed in 2018 that they are enthusiastic for nonwhite and female candidates — the current Congress is the most diverse ever, with a record number of women, almost entirely due to Democratic wins. Perhaps reflecting that, non-straight-white-male candidates appear to feel that now might be their time — the current field includes black, Asian, Latino, gay and female candidates. Still, Sanders is performing well in early polls. To win the nomination — and to win the presidency — he'd have to figure out how to put together a broad coalition of diverse voters. Knowing this, Sanders has shifted his message somewhat this campaign. In his opening rallies of his 2020 campaign, Sanders invoked his activism for racial justice, including a college-era protest against segregation that got him arrested. Martin: "Would you support a reparations plan designed specifically to narrow that gap?" Sanders: "Yeah — but not if it means just a cash payment or a check to families. I would not support that. ... I am sympathetic to an idea brought forth by Congressman Jim Clyburn. ... And he has what he calls a 10-20-30 plan, which says that 10 percent of federal resources should go to communities that have had 20 percent levels of poverty for 30 years. In other words, the most distressed communities in America...."
Martin: "But is there something special unique and exceptional that needs to happen when we're talking about the sin of slavery?" Sanders: "Well, you're right. The horrors of slavery all are horrors that are impacting African-Americans today. And it must be addressed. But I think if you're looking at the most distressed communities in this country, which is what Rep. Clyburn is talking about, unfortunately, they are often African-American communities, often Latino communities, sometimes white communities...."
Martin: "I'm sorry to interrupt you, but Ta-Nehisi Coates, who has kind of claimed credit for the current intellectual movement behind reparations, has called for a national reckoning — that it doesn't matter if the policies in practice actually do what you're talking about, there needs to be an emotional awakening." Sanders: "I think that's a very good point. I think that many of us, obviously Caucasians, are not fully aware of the horrific impact not only impact, but it's almost the unspeakable reality of what slavery did to this country." Sanders said he supports reparations, but the specific policy he describes here doesn't fit what experts say is the definition of such a policy. The 10-20-30 plan, for example, would likely disproportionately improve the lives of black Americans, who have higher rates of poverty than white Americans. But the point of reparations is to address the wrongs of discriminatory policies, including slavery, Jim Crow laws and redlining. This plan does not specifically aim to boost black Americans affected by those policies, nor does it include an element of specifically addressing and healing from those policies. "Something that is economically inclusive but has a racial bent to it — those may or may not be good policies," Ohio State University professor Darrick Hamilton told NPR recently, "but let's be clear: It's not reparations." Sanders did tell NPR he thinks white Americans need to be better educated about slavery. But he doesn't say it would be part of a specific reparations policy. "I think what we have to do, and I will be doing it, is to do a better job maybe in explaining what we mean by socialism — democratic socialism. Obviously, my right-wing colleagues here want to paint that as authoritarianism and communism and Venezuela, and that's nonsense. "What I mean by democratic socialism is that I want a vibrant democracy. I find it interesting that people who criticize me are busy actively involved in voter suppression trying to keep people of color or low-income people from voting, because they don't want a vibrant democracy. I do. "Second of all, what it means, Rachel, is that in the wealthiest country in the history of the world we can provide a decent standard of living for all about people. That's just the reality. That's not Utopian dreaming; that is a reality. Health care for all can be done, and we can save money in doing it. We can have a minimum wage which is a living wage, and I'm delighted to see that, you know, right now, five states already passed $15 an hour minimum wage. The House of Representatives is gonna do it. We have got to do that." Republicans appear to be ramping up to make the term "socialism" one of their key weapons in the 2020 race. President Trump has repeatedly criticized socialism in his tweets and in speeches this year, and the term was repeatedly invoked at this year's Conservative Political Action Conference, or CPAC. The term "socialism" is polarizing in U.S. politics — a slight majority of Democrats, 57 percent, said they had a positive view of socialism (however they define it) as of August 2018, according to Gallup. In that poll, Democrats were slightly more likely to view socialism positively than capitalism (47 percent). Meanwhile, Republicans were far more likely to view capitalism positively (71 percent to socialism's 16 percent). Polls have also shown that socialism is particularly popular among younger voters. While Sanders' "socialist" brand may play well among primary voters, it could be tougher to sell among more moderate Democrats and centrist or right-leaning independent voters. A recent NBC News/Wall Street Journal poll provides some evidence of this: Only 25 percent of Americans said they'd be enthusiastic or comfortable voting for a socialist, while 72 percent said they had reservations or were uncomfortable with the idea. Kelli Wessinger and Eric McDaniel produced and edited this interview for broadcast.